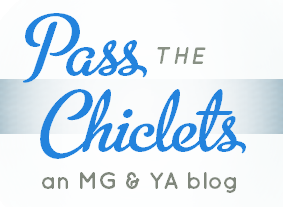 Pass the Chiclets: fall update: checking in/out. Wow, I've been super-absent. And there I was three posts ago, anticipating that things would get busy around Pass the Chiclets... I always have the best of intentions, and those never hold up against my inertia, sigh. Blogging inertia, that is — it's been quite busy in the non-virtual aspects of my life, but I won't attribute this lack of blog momentum entirely to real, outside life. No, it's gotten to the point where I really have no idea what I want from this book blog, or the book blogging business in general. I think disenchantment and distance from the original road I was trying to chase when I first started have stoppered the inspiration, or motivation, or whatever it was that powered this blog and my writing. And it doesn't feel too important at this point to get the flow back. At the same time, I'm proud of this blog. I hope I'll never stop being proud of it. It'll remain right here and alive while I take a hiatus of indeterminate/possibly eternal length. I'll probably be withdrawing from Twitter, too (although if you tweet at me, I will definitely respond!). So thank you for reading. May your days be prosperous and joyous.